Details: The tutorial article provides step-by-step instructions on how to use the Embedded Crystal Report Designer in IBM Rational Application Developer (RAD). It explains how to embed Crystal Reports in Web applications with Java Database Connectivity (JDBC), both at the design phase and runtime. The example is based on IBM Rational Application Developer v6.0.1.1 with the default Crystal v10 features installed. IBM DB2 Universal Database v8.1 is used as a source for reporting in this tutorial lesson. 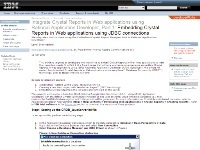 The result of this tutorial is a JSP web page containing the embedded Crystal Report.